Diani is a luxurious beach town in Kenya normally referred to as to as Mombasa South Coast. 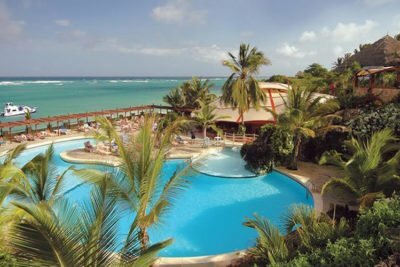 Known for awesome Diani beach hotels, coral reefs, plush white sands, and verdant forests, Diani is a versatile area popular with people of all ages. In addition to fantastic surfing conditions, the intimate town is filled with exotic wildlife, elegant resort hotels, and a shopping center. Escape to Kenyan’s small paradise. Here are some of the best handpicked hotels in Diani perfect for your holiday or honeymoon getaway. When vacationing on Diani Beach, Mombasa South Coast Kenya, there is only one hotel that can claim to be the leader among the Diani beach hotels offering All Inclusive accommodation, Baobab Beach Resort and Spa. What makes this Diani Beach Resort truly unique among the many Diani beach hotels the are the networks of refreshing pools that spread throughout the entire property. Its also one of the best all inclusive hotel in Mombasa. 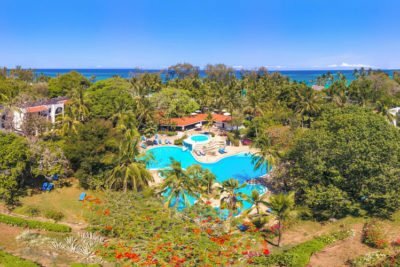 Set in a beautiful tropical garden and with on the best beach fronts on Diani beach, this all inclusive Diani hotel is one of the best places to soak up the sun and relax in Mombasa. Neptune Village Beach Resort & Spa is set on Diani Beach overlooking the Indian Ocean. 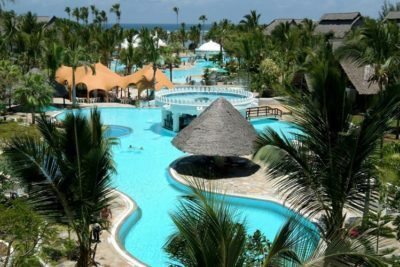 This all-inclusive resort in Diani is one of the best affordable Mombasa hotels. Its ideal for a quite beach holiday. Beautiful Neptune Palm Beach & Spa is located on Diani Beach on a prime beachfront location. 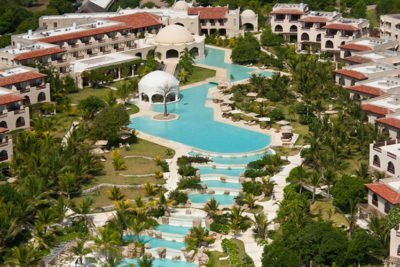 This all inclusive Diani resort is one of the few Boutique hotels in Mombasa. 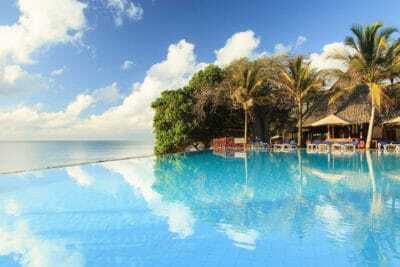 Leopard Beach Resort is on the shore of Africa's famous and dazzling Diani Beach. 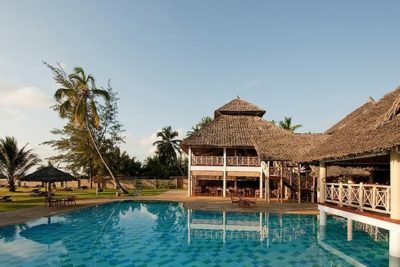 This award wining 5 star Diani Beach hotel is where you need to go if you are looking for a fine beach hotel in Mombasa. Jacaranda Indian Ocean Beach Resort stands out among Diani hotels. Its stunning white sand beach is on the Diani Beach South coast of Mombasa, where you can swim, sun, and relax. 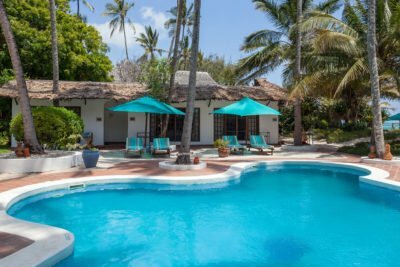 Set in a peaceful corner of Leopard Beach in the Diani Beach, this resort is a distinctly up-market hotel one of a kind in Mombasa of 28 fully serviced villas within 15 acres of tropical forest. 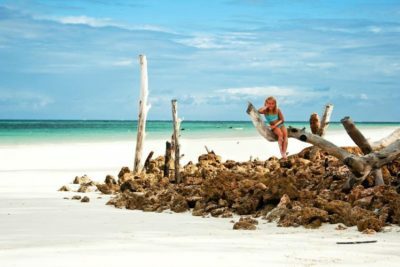 Find your escape at the Swahili Beach Resort. It's a slice of paradise in Mombasa south coast, Diani beach. Indulge all of your senses in this Diani beach hotel. 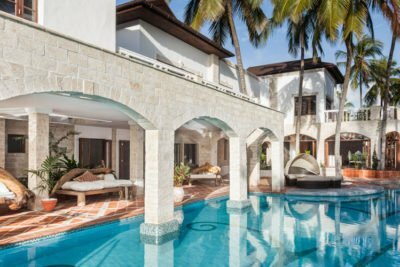 Situated on the tranquil side of Diani Beach, Kenya is Lantana Galu Beach set in lush tropical gardens and along one of the most exclusive and pristine beaches of the Kenyan coast. What says peace and relaxation more than your very own private island right off the coast of the world-famous Diani Beach? Make your dreams a reality at The Sands at Chale Island. This exclusive, multi-star Diani hotel features a spectacular design concept and personalized service. Maji, the word for water in Swahili, describes this Diani Beach location perfectly. 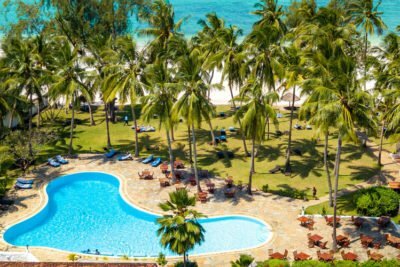 A land of lush greenery and sparkling white sands, invites you and your family to take leave from your busy, stressful schedule and relax in one of the many Diani beach hotels, under an umbrella with a glass of fresh juice and breath in the crisp clean and fresh air breezing from the blue ocean. 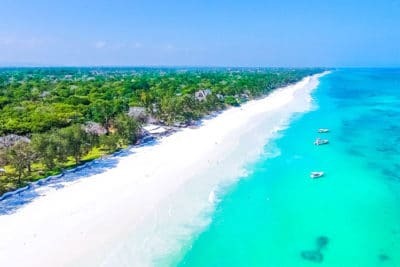 Diani beach is an Intimate, vibrant, small paradise on the calm and quiet shore of the blue Indian Ocean as the East Coast of Africa and the south of beautiful Kenya. 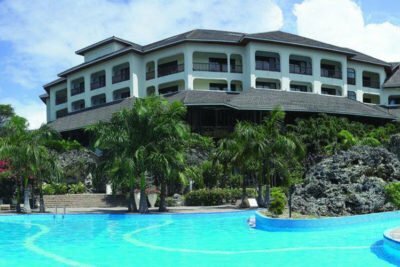 Tacked in this coastal part of Kenya are some of the best resorts in the country. Situated just about an hour flight from Nairobi, Diani beach is graced with extensive green vegetation lining the ocean, including copious palm trees which concealment the coastal areas and with shallow shores presenting the capability of having walked along the beach as the sun sets and in the morning as it dawns. Diani Beach hotels are also home to numerous weddings and corporate getaways. Diani Beach is also established as a Kitesurfing location, sky diving location. In most of the Diani beach hotels, there are water sports centers that make it easy for you to have fun and enjoy the land. The Holiday Dealers will make your visit to Diani memorable and will give you the best deals in the market. Let us handle your holiday nitty gritties as you enjoy. We have handpicked some of the best resorts for you at Diani that cut across all budgets. 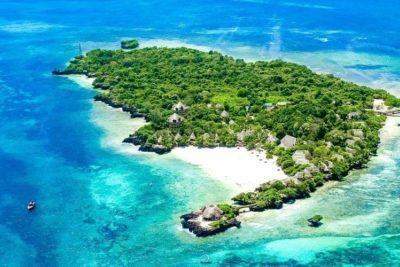 Diani Beach in cooperated with several beaches, Galu Beach, Tiwi beach, Che island, Funzi Island, Kinondo and Msambweni. On all these beaches there are a handful of Diani beach hotels. This makes Diani a great destination for families and couples going on holidays . Experience the fuzziness of the ocean by choosing a Diani beach holiday. The beach stretching for over ten kilometers is suitable for team building sand games like tug of wars, netball and beach soccer. Diani beach htoels offer a place to connect with nature as it presents a peaceful and an environment to sit back, relax and enjoy. There is a wide range of hotels in Diani that cater to different lifestyles. 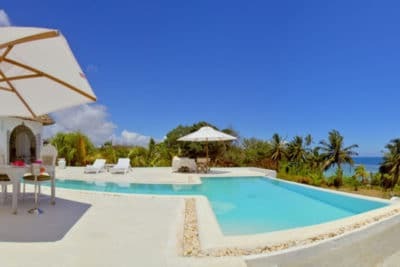 Luxury options include Baobab Beach Resort & Spa, Leopard Beach Resort and Spa, Swahili Beach Resort, Jacaranda Indian Ocean Beach Resort, Southern Palms Beach Resort and The Sands at Chale Island. If your goal is to be pampered, these properties cater to your every whim: you’ll enjoy classy spas, delicious meals, and stylish rooms. 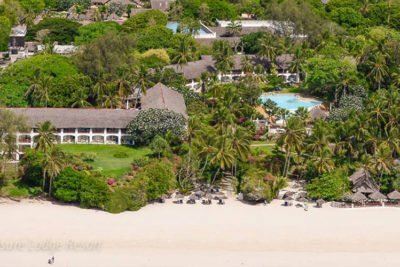 Most of the Diani beach hotels offer direct beach access, and some are set among the area’s pristine gardens, allowing you the opportunity to enjoy Diani’s natural beauty every day. If you prefer cozier accommodations, try a Diani boutique hotel. Options include Afrochic Diani Beach, The Maji Beach Boutique Hotel, and Neptune Palm Beach Boutique Resort & Spa. These intimate properties provide an elevated home-away-from-home experience, all within a stone’s throw of the beach and a short drive from some of the area’s most exciting activities, like deep sea fishing and stunning national reserves. 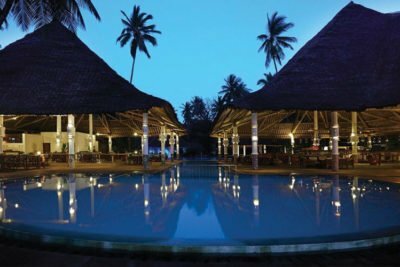 The Leopard Beach Resort and Spa, Swahili Beach Resort, and Jacaranda Indian Ocean Beach Resort all offer magnificent locations on Diani Beach, and fantastic half board packages. 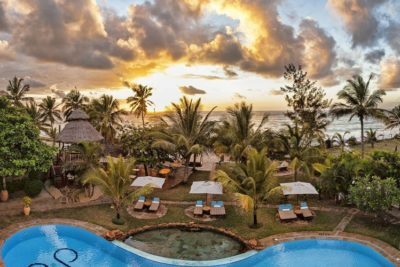 Review these gorgeous Diani Beach hotels to discover their facilities, food and drink options, activities, and extra services to enjoy a relaxing and luxurious retreat. Water sports and kite surfing enthusiasts have much to do in Diani. The beach provides prime surfing and snorkeling conditions. There are also dive centers in most of the Diani beach hotels, which provide the equipment needed to enjoy deep-sea adventures, explore the fringing reefs, and observe undersea life. For flawless views, head to chale Island, just a few hundred meters from Diani along the coastline. Here, visitors will observe baboons, bush pigs, turtles, and mongooses in their natural habitats. For those who prefer to stay indoors, many of the area’s grand resort hotels have spas that offer massages and wellness treatments. There are also many luxurious dining options in Diani beach hotels, including high-end restaurants, bars, and bistros on the properties. Shopping is also a major area pastime: The Diani Beach Shopping Centre provides access to dozens of popular retailers, and there are many local retailers that cater to tourists and carry artisanal, handmade goods. There are several airlines that travel from Nairobi to Diani Beach, including Safarilink, Jambojet Limited, FLYSax, and Air Kenya. These low-cost airlines provide regional flights, many of which are available multiple times a day. 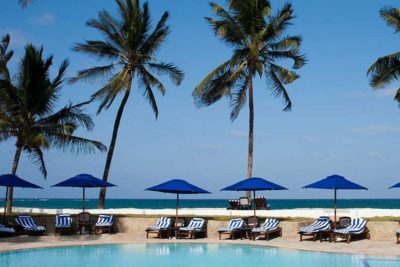 A good number of Diani beach hotels will offer complimentary transfers from the Ukunda Airport to the hotels. Fly 540 sister airline FlySax flies to Diani also know as Ukunda Daily. The FlySax flights take off from Wilson Airport on Langata road every day at 12.30Pm. Boarding is done at Langata House. FlySax is one of the cheapest airlines to consider for flights to Diani from Nairobi. FlySax also flies to other Safari Destinations like the Maasai Mara, Entebbe, Lamu and Malindi. Most Diani Beach Hotels offering flying packages partner alot with FlySax. AirKenya flies to Diani also know as Ukunda Daily. The AirKenya flights take off from Wilson Airport on Langata road every day at 0930am. Airkenya also flies to other Safari Destinations like the Maasai Mara, Lewa, Amboseli and Samburu. 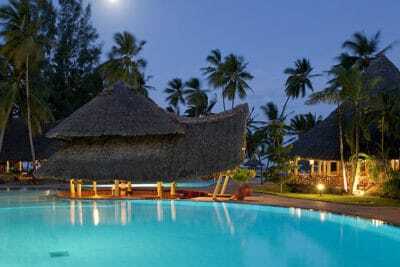 A good number of Diani Beach hotels offering flying packages have partnered with Airkenya. Safarilink flies to Diani/Ukunda Daily. On some days the flight will go Via Vipingo. The Safarilink flights take off from Wilson Airport on Langata road. Safari also flies to other Safari Destinations like the Maasai Mara, Lewa, Nanyuki, Lamu, Amboseli, Tsavo and Samburu. JamboJet flies to Diani also know as Ukunda twice Daily. This the cheapest airline to Diani. The JamboJet flights take off from Jomo Kenyatta International Airport. Depending on the season, JamboJet can introduce more flights to cater for the demand. A good number of clients going to Diani Beach hotels prefer using JamboJet because of its lowcost. JamboJet also flies to other Safari Destinations like the Lamu, Mombasa, Malindi and Kisumu. We currently don’t have any Diani Beach Hotel that offers packages with JamboJet. Non-stop flights from Nairobi generally take about an hour to reach the destination. Other flights may depart from Kenya’s main airports, which include Jomo Kenyatta International in Nairobi, Moi International Airport in Mombasa. It’s worth noting that Air Kenya and SafariLink offers flights from Diani to Masai Mara, the famed game reserve in Narok County via a connecting flight from Wilson Airport. The busiest flight booking seasons are from late December to late March and early July to late October. It’s least busy from April through June. It is had to mention Diani Beach and Diani beach hotels and fail to mention Shimba Hills. This the place to go for a quick safari when staying in Diani. This is a tropical rain forest which covers an area of 202 km2. It is one of the largest coastal forests in East Africa . Shimba Hills Reserve is rich in flora and fauna and hosts the highest density of African elephant in Kenya. This is home to the endangered Sable Antelope, African Elephants, Giraffes, Leopard, Genet, Civet cat, Hyenas, Waterbuck, Bush pig, Buffalo, African Bush Baby, Bushbuck, Coastal Black and white Colobus, Blue Duiker, Bush Duiker, Red Duiker, Greater Galago,Black-faced Vervet Monkey, Sykes Monkey, Serval cat, Black and Red Shrew, and Knob-bristled Suni Shrew. Shimba Hills Reserve is an haven for birds with over 100 bird species having been recorded. These include the Ostrich Eagle, African Hawk; Falcon, Cuckoo; Guinea-fowl, Kenya Crested; Honey guide, Greater; Hornbill, Crowned; Quail, Blue; Sunbird, Uluguru. If you are staying in Diani Beach longer you can always consider more comprehsnive safaris to other places in Kenya. Below are a few Suggestions . On Arrival Board a spacious traditional dhow, light breakfast, fruit all snorkeling & diving gear on board the dhow. Visit Kisite Marine Park – branded as home of the dolphins! Dolphin watching – 90%+ dolphin success rate! Non swimming guests can enjoy the underwater using glass bottomed viewers from the accompanying support dinghy. Dhow sailing – a tranquil step back in time. Lunch on Wasini Island at Charlie Claws. Enjoy an exotic lunch that includes: marinated fish and coconut biting, steamed crab in ginger sauce – the famous Charlie Claw’s specialty, fish fresh from the fisherman’s basket, for non – seafood – fresh traditional vegetable soup followed by barbequed chicken or Swahili vegetarian. All served in traditional style with Swahili sauce, rice and chapatti – a traditional Wasini Island celebration dish! Kitesurfing is slowly becoming one of the water sports attracting holiday lovers to Diani beach. This is a water sport that can be learned quite fast with the right training. A few guided tough steps with a pro and soon you will be gliding the waters and the waves line a pro. Galu Beach beach on the larger Diani Beach is one of the best spots for this sport. This is where you will get an established kite surfing community to hang around with and pick a few tips from. Perfect wind conditions and beautiful tropical beaches , make Diani one of the best places to come do some Kitesurfing. Look out for H20-Extreem in Diani. They will guide you on all you need to know when it comes to this water sport and more.